Denocrat Registrar of Voters Matthew Waggner was back in the office Tuesday, following an incident where his GOP counterpart, Roger Autuori, slapped him in the face. The Republican Registrar of Voters admitted to police that he pushed and slapped his Democratic counterpart, but under state law, Roger Autuori can continue to serve in his elected position without interruption. Autuori, 61, was charged with breach of peace following the incident last Friday evening between himself and Matthew Waggner as they were preparing voting equipment for the Nov. 5 municipal election in a storage area of the Senior Center on Mona Terrace. In statements to police, Autuori said that Waggner, 33, "was acting like a baby all day long" and he had become frustrated because Waggner was "purposely" doing things that "would slow everyone down." The registrars, who are guaranteed election by virtue of nomination by their respective political parties, both were elected to four-year terms last November. They are each paid $32,225 for a job that is classified as part-time. Secretary of the State Denise Merrill said the registrar position is the only elected position for which state statutes have no provision on removal from office. Merrill said she is concerned about the incident. "We just cannot tolerate any kind of violence around our election process," she said, adding that her office stands ready to help in any way for the impending town election. She said Waggner and Autuori have to settle their differences. Autuori "has to decide for himself," Merrill said, "if he thinks he can control, or possibly step aside, even temporarily." 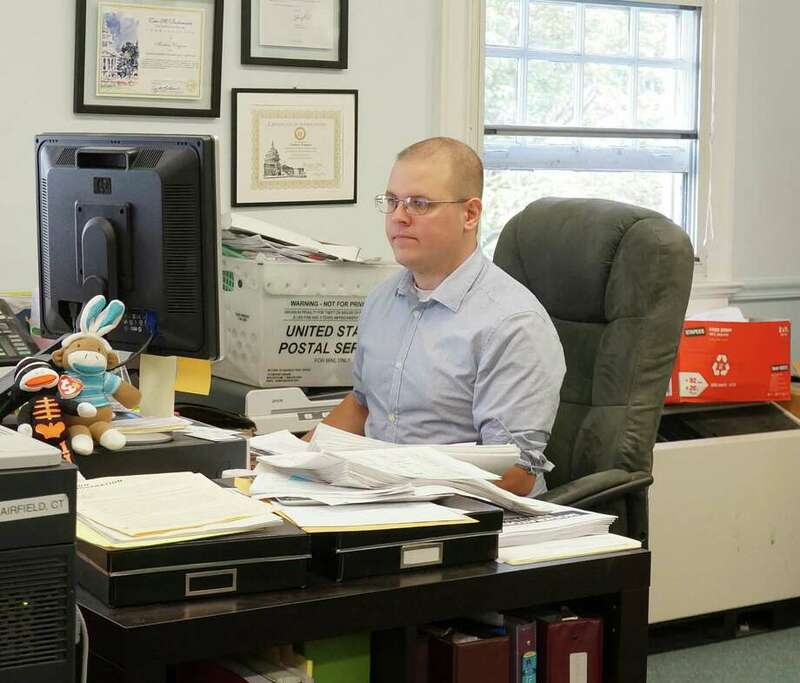 Autuori has not been in the registrars' office in old Town Hall this week because of a death in his family, Republican Town Committee Chairman James Millington said, although his deputy, Steve Ellworthy, has been. Waggner was in the office Tuesday, but declined to comment on the incident other than to say he wants to allow the case to follow due process. According to the police report, Waggner said he was putting optical-scanning voting equipment into a bin and, "Roger found out that he was putting the scanners on the wrong side of the bin and confronted him about it. When Roger entered the room, he automatically grabbed Matthew's neck and yelled, `What are you doing!' Matthew then began to yell for help, which was when Roger then pushed Matthew away by pushing his shoulders. Immediately after Roger pushed Matthew away, Roger then hit Matthew in the right cheek with an open left hand." The two had separated and were in different rooms when police officers arrived. Town government has a zero-tolerance policy with regard to workplace violence, and violation of the rules subject the employee to disciplinary action, up to and including discharge. However, the registrars report to Merrill's office as far as the operation of their office, and are elected to their positions. Democratic Town Committee Chairman Ellery Plotkin on Monday called for Autuori to resign. But Millington said he's concerned about the possible impact that fallout from the incident may have on the municipal election in less than two weeks. "I have some concerns here with this upsetting the election," Millington said. He said it is his understanding that the town's Human Resources Director Mary Carroll Mirylees told the registrars they were not to be in each other's presence until the issue is resolved. When asked about any action that the town may be able to take, Mirylees responded that she does not comment on personnel issues. "If that's accurate, that's not going to work because we have an election coming up," Millington said. "I hope HR can sit down with them and establish hours when each will be in the office," while their respective deputies will be on duty when Autuori and Waggner are not. Millington said the two registrars have never gotten along "from day one, there have been conflicts and arguments along the way and it's been a two-way street, but they were still able to work and get things done." He said the Human Resources Department has the experience and expertise to step in and mediate. "Everybody needs to hit the re-set button, sit down and hash this out," Millington said, at least to allow the town to get through the Nov. 5 election.